Whether herbal, oolong, black, white, or green, your favorite loose teas now have a clever companion! 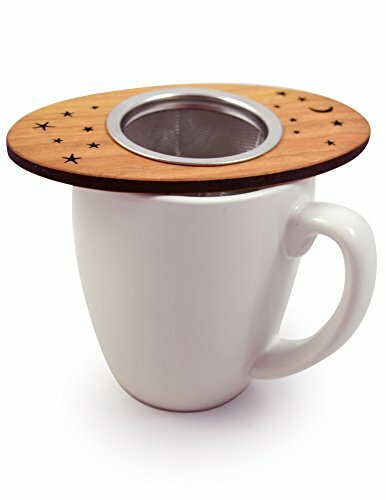 Crafted of natural wood with a stainless steel basket, the Tea Nest features wide design that sits atop your teacup or mug, keeping the tea hot while the basket steeps. The solid wood is sustainable hardwood cherry with a flame-blackened edge and a laser-cut moon and stars motif, made with no plastics, stains, or chemicals. The removable strainer basket allows for simple, easy cleaning. Mug not included. Made by hand in USA. Care for your solid wood: If needed, use a Scotchbrite pad (or similar scrubber) with dish soap and warm water. Dry with a towel or allow to air-dry - as with all wood utensils, they are not recommended for dishwashers. Occasionally oil your utensils with natural coconut oil, mineral oil, walnut oil, or beeswax using a paper towel or dry cloth. Whether herbal, oolong, black, white, or green, your favorite loose teas now have a clever companion!